PRIOR LAKE, MN – A planned slaughter of 2,000 pigeons here this Thursday by a Ducks Unlimited chapter may well be illegal, according to an opinion about pigeon shoots by former Minnesota Attorney General Hubert Humphrey. An international animal protection group said it plans to call for a criminal investigation if the killing goes on as planned. The Prior Lake Ducks Unlimited chapter announced the shoot will begin at 11 a.m. Thursday, March 19, at the Minnesota Horse and Hunt Club, followed by – according to the invitation – a "fun-filled evening." But, SHARK (SHowing Animals Respect and Kindness) said the shoot – which was cancelled last year by Ducks Unlimited after it was brought to the national group's attention – is illegal, noting "We fully intend to pursue this issue with state authorities. If this shoot does happen, then not only will Ducks Unlimited be embracing vicious cruelty, but potentially an illegal act as well. Again, we thank you for shutting the heinous shoot down last year, and we hope you will do the same this year," said SHARK in a letter to Ducks Unlimited. 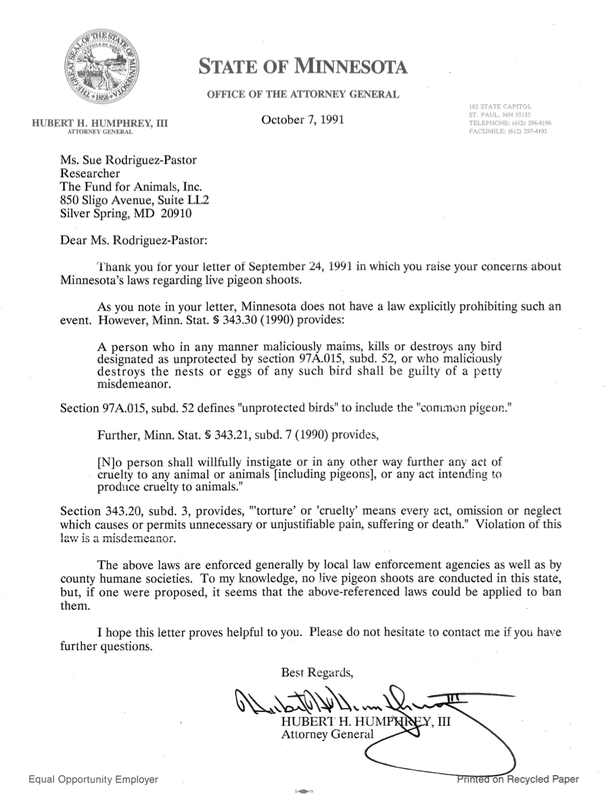 SHARK said it sent Ducks Unlimited a letter from former Minnesota Attorney General Hubert Humphrey (October 7, 1991) that commented on Minnesota’s anti-cruelty law and pigeon shoots. AG Humphrey's advisory letter stated that,“To my knowledge, no live pigeon shoots are conducted in this state, but, if one were proposed, it seems that the above referenced laws could be applied to them." In 2014, SHARK exposed the same live pigeon shoot at the Prior Lake, Minnesota chapter of Ducks Unlimited, and produced THIS video criticizing DU. Ducks Unlimited quickly shut the shoot down and replaced it with a clay target shoot. SHARK praised this decision and thanked Ducks Unlimited CEO and former Fish & Wildlife official Dale Hall, for doing the right thing. In an email sent to SHARK last year, Ducks Unlimited Senior Communications Specialist Matt Coffey explained the shutdown: "We have policies in place holding our staff and local volunteers to high ethical and moral standards, and do not condone wanton waste of wildlife or other animals. To avoid the potential for wanton waste, the event committee has decided to change the live pigeon event to a sporting clays shoot." Last Chance for Animals urges Ducks Unlimited not to soil its reputation by sponsoring a live pigeon shoot. While LCA and Ducks Unlimited do not agree on hunting in general, both organizations should be able to agree that wanton slaughter serves neither side’s stated ethics. Once the pigeon shoot happens, Ducks Unlimited will never again be able to claim it supports hunting ethics. Last Chance for Animals encourages Ducks Unlimited to cancel this gratuitous slaughter.